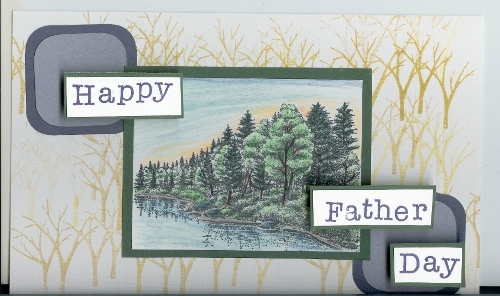 Make a father's day card with a forest theme with this craft project from Terri Sproul. Tree and letter stamps add wonderful detail to this homemade stamped card. Stamps: "The Netherlands" by All Night Media, Stampscrapes "Autumn Bank"
Large Cardbase 81/2" x 5 3/4"
Stamp Netherlands tree onto cardbase using "Haystack" ink pad - I ink the stamp once - stamped in twice, ink again - stamped the image twice. This give the look of two different color inks in the back ground. Stamp "Autumn Bank" using India Ink onto White cardstock. Color in image using my Faber-Castell Pencils. Cut around image and matt image with Dark Green Cardstock. Cut out two 2" squares in Dark blue and 2 1 3/4" Squares in Light Blue cardstock - Round the corner on all piece. Adhere smaller square in the center of large square. Stamp using Letter stamps and "Starry Night" ink "Happy Father's Day" onto whitecardstock - cut out each of the words and matte onto Dark Green Cardstock. Put the card together as sample shows. I used Pop Dots on the "happy Father's Day". In place of the forest scene I am using a photograph I took of the woods near the cottage we rented when we celebrated our wedding anniversary this past May. This card is perfect for this photo.